VOLUNTEERS helped to plant 200 trees this month in ‘Shurnhold Fields’ to commemorate the fallen soldiers of World War One from the Melksham area. 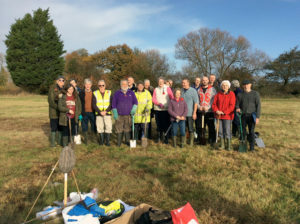 The special tree-planting event was organised by the ‘Friends of Shurnhold Fields’, a group formed of local people to support the ongoing development and maintenence of the new mini country park on the site of the former George Ward School playing fields. More than 10,000 trees were planted across Wiltshire to remember the Wiltshire soldiers who gave their lives in World War One.